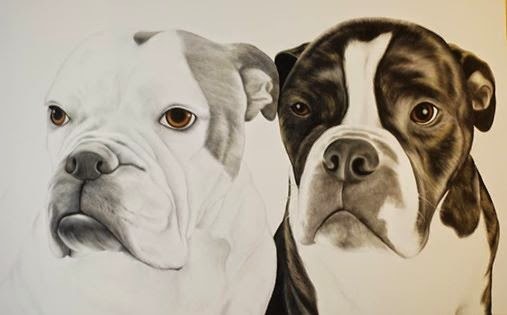 I was commissioned to paint Arnie and Benson who are 2 Bulldogs full of character! Sarah found me on the internet whilst searching for an artist to paint her two boys. I was thrilled as bulldogs are great portrait models with very characteristic faces and lots of wrinkles and the fact there were two of them looking ever so slightly grumpy was an added bonus. Sarah followed up with a lovely e-mail why she picked me! I did google dog portraits to find you. I looked at quite a few artists whom were very good but I googled names as well and liked your background in art. Also the fact you grew up on a farm and love animals helped in choosing you to paint my two boys. Everyone have shown the picture to says how good it is and I think the detailing looks fab. Haven't told the other half so will be a nice surprise for him and I cant wait to see it. !